Located at one of Fullerton 's busiest intersections in the heart of the central business district, the Italian Renaissance-inspired Alician Court Theatre has been the dominant landmark in the City's historic downtown for over eighty years. Constructed in 1924-25 for $300,000 by local businessman C. Stanley Chapman, the son of Fullerton's first mayor, the mixed-use building was designed to function as a combination vaudeville/silent movie house flanked by a one-story retail unit on the south side with a two-story garden café on the north. The Theatre was Orange County's first movie palace, and the site of regularly scheduled film premiers. When it opened in May of 1925, the Theatre was the largest motion picture house in the County, representing the height of Hollywood glamour and sophistication. In 1929, a Spanish Colonial Revival super service station, designed by Stiles O. Clements of Morgan, Walls & Clements, was added to the south side of the building. In 1930, the Chapman family traded the Theatre Complex for a 940-acre ranch, and the building went through a series of names changes before finally becoming the Fox Fullerton Theatre, the name most popularly associated with the movie house. The Fox Fullerton Theatre was constructed by the prestigious firm of Meyer & Holler, Inc. of Los Angeles , one of the most famous builders in movie theater history. At the time of the Fullerton Theatre's construction, Meyer & Holler, Inc. was the largest contracting firm in Los Angeles. In addition to its two best known buildings—the Egyptian and Chinese Theatres in Hollywood—the firm built movie studios and residences for many elite members of Southern California society, including Harry Chandler, Edward L. Doheny, Hal Roach, Samuel Goldwyn, Charlie Chaplin, and King Vidor. 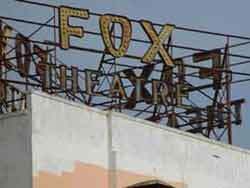 The Fox Fullerton Theatre is the only extant movie theater built by Meyer & Holler outside of Hollywood. 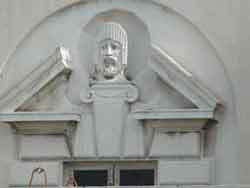 The Fox Fullerton Theatre was designed by noted architect Raymond McCormick Kennedy (1891-1976). During his lengthy employment with Meyer & Holler, Kennedy participated in the design of hundreds of projects, and was responsible for many notable buildings, including Grauman's Chinese Theatre, the Petroleum Building (714 West Olympic) for Edward L. Doheny, the Security Pacific Building (6777 Hollywood Blvd. ), second only in height to the Los Angeles City Hall when it was built in 1927, the West Coast Theatre in Long Beach, and the Whittier City Hall. He was also one of a number of architects that worked on the Pentagon in Washington , D.C. 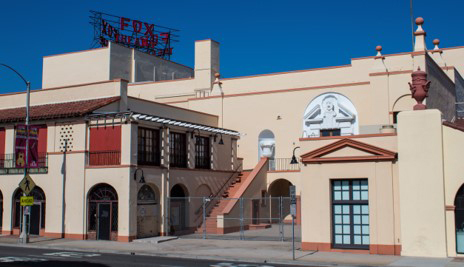 The Fox Theatre is an outstanding example of Kennedy's handling of Italian baroque elements and is his only completed work in Orange County. The Theatre's interior features six canvas murals on the history and development of California created by A. B. Heinsbergen and Company, one of the leading theatrical decorating firms of the period, and additional hand-stenciled murals and iconographic artwork by notable artist John Gabriel Beckman, who also designed the murals for the Chinese Theatre in Hollywood and the Avalon Casino on Santa Catalina Island. The artwork created by Heinsbergen and Beckman represents their major commissions in Orange County.